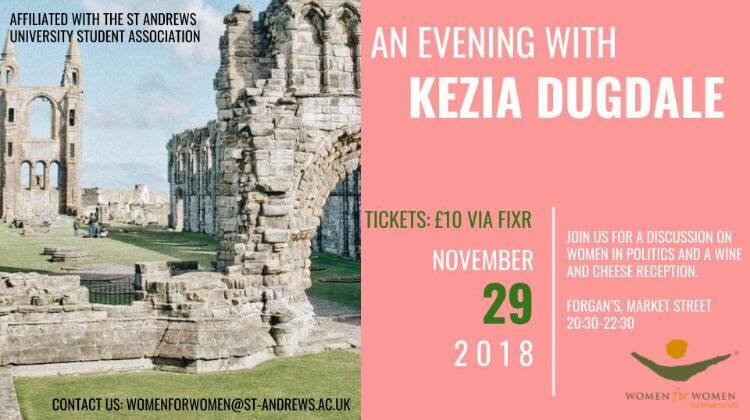 In the lead up to their anticipated event, ‘An Evening with Kezia Dugdale’, The Stand sat down with Women for Women International Society to discuss the charity, its aims, and what you can do in St Andrews to make a difference. Women for Women International is a charity that supports women in seven different post-conflict countries: Kosovo, Afghanistan, Bosnia and Herzegovina, Congo, Iraq, Nigeria and Rwanda. W4W provides practical and moral support to women through their ‘sisterhood programme’, building support networks and helping them to get on track vocationally and to increase their assets and income. The results of W4W’s work are priceless: within just one year on the programme in Nigeria, the percentage of women with knowledge about their rights increased from 3 to 98% and personal monthly earnings dramatically rose from 12 dollars 90 cents to 35 dollars 21 cents. Women for Women International Society works throughout the year in St Andrews to raise awareness and to support the main charity’s efforts. They raise money by organising events – such as their hugely popular ‘St Andrews Bake Off’ event at the Vic earlier this month and their landmark ‘Women in the Arts’ event occurring in semester two. Taking place on Thursday the 29th November at 8.30 pm at Forgan’s, ‘An Evening with Kezia Dugdale’ is the first event of its kind in W4W’s busy calendar. Kezia Dugdale is a Scottish politician who served as leader of the Labour party between 2015 and 2017, and who is also widely known for her appearance on ‘I’m A Celebrity Get Me Out of Here’ in 2017. Although not a political event, the evening will provide information about Kezia’s experience as a woman in politics – therefore will be invaluable to any student interested in pursuing a career in the political sphere. Tickets include a wine and cheese reception with prosecco and nibbles, as well as the opportunity to ask questions and meet Kezia after the talk. In addition to this, by attending the event you will directly be supporting the charity’s efforts: with 100% of all profits raised going towards sponsoring another sister in one of the priority countries. “We hope to not only raise as much money as possible but also to raise awareness about the importance of equality and opportunities for everyone no matter of gender, race or ethnicity – be that who we sponsor or the people we work with in St Andrews”. ‘An Evening with Kezia Dugdale’ takes place on Thursday 29th November from 20:30-22:30 at Forgan’s and is open to both students and non-students. Due to the smaller capacity of the event, tickets are limited and it is strongly recommended that you purchase in advance to avoid disappointment.